Drain and place the chickpeas and sweetcorn into a food processor. Pick the coriander leaves, then add half to the processor along with all of the stalks. Add the spices, lemon zest, flour and a pinch of salt, then pulse until combined, but not smooth – you want to retain a bit of texture. Squeeze a large dollop of ketchup onto the base of each bun (toast them if you like), then top with the burgers. 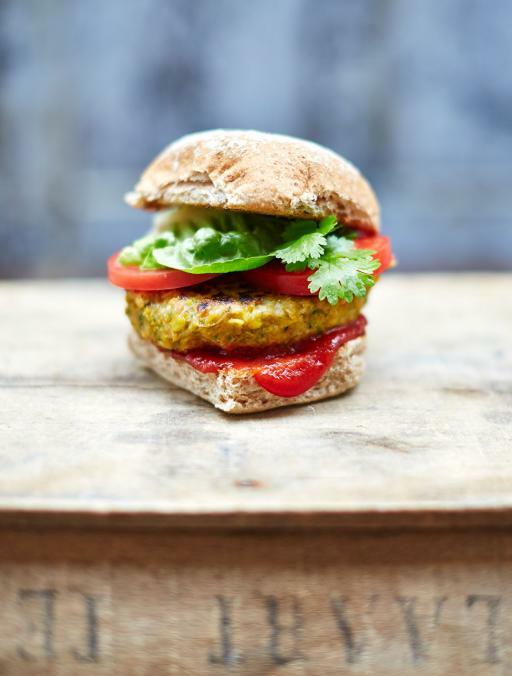 Layer over a couple of slices of tomato, a lettuce leaf, a few coriander leaves and finally the burger tops. Serve with a crisp, green salad, if you like.